Meat lovers, here it is!!! Your meat and potatoes dish!! Jump up and down! Do a dance! Shake your booty! I’ve had some requests/complaints/suggestions/bitching that I don’t put a lot of meat recipes up on the blog. I started thinking about my meat-eating habits and realized that I don’t eat a lot of meat. At least not big hunks of meat like chicken breasts, pork chops, or steaks. Deli meat…now that’s another story…. I am a big fan of deli meat (Boar’s head deluxe ham come to mommy) which is probably the worst type of meat for you. I am aware of this. Thank you. I probably eat about a 1/2 lb a week so hold your horses before you start your rant. I don’t really cook meat too often at home. I eat quite a bit of pasta with veggie sauces, seafood, and sometimes just some rice and steamed veggies. I have my parents to thank for this. My parents have typically been very healthy eaters. Now they are annoyingly healthy eaters. Honestly, who really eats so healthy?? Um, they do. They are both vegetarians and always forced me to eat a ton of salad and veggies growing up. Even now if I don’t eat a salad every day my body feels “off.” I’m grateful they instilled in me healthy eating habits. Even though I might not adhere to these so-called healthy eating habits all the time, I am always conscious about my food decisions and what I’m putting into my body. I am quite content with my meat intake and do crave steaks (and eat them occasionally) but chicken and pork just don’t do it for me. Chicken wings? Ok, fine, occasionally. Chicken breast? Eh..usually dry and bland. Pork chops? Nah, don’t really like the texture. A cuban lechon? Yes, please. I guess I’ve just become very selective with how I eat chicken and pork. If it’s not prepared in a way that I like (and there aren’t many ways)–I’m not eating it. 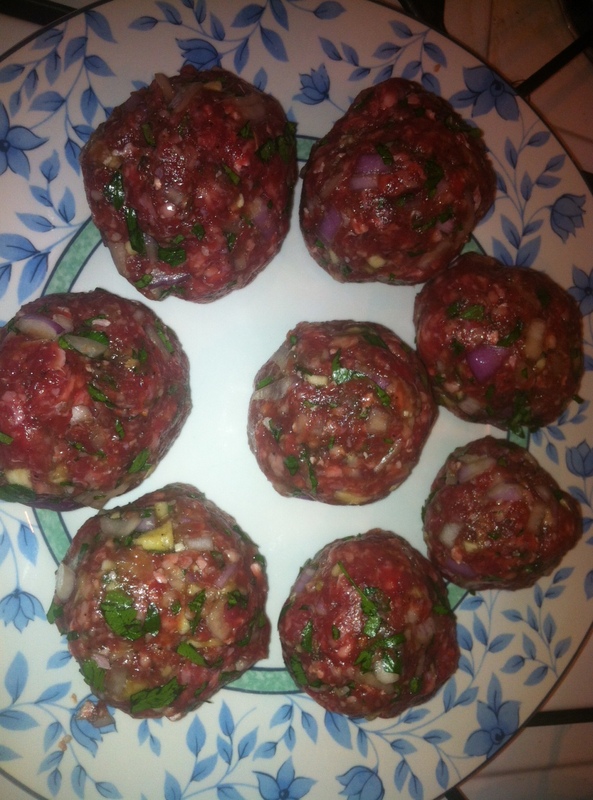 I did use grass-fed beef for the meatballs (don’t roll your eyes) but feel free to use any type. I’ve used ground turkey for these before in the past. Bring a pot of salted water to boil and boil potatoes until they are fork tender. You want them soft enough to mash them. While you’re waiting for the water to boil in a large bowl combine the garlic, onion, parsley, egg, and ground beef, and salt/pepper and mix with your hands. Don’t overwork the meat too much, just enough to evenly distribute all the ingredients. 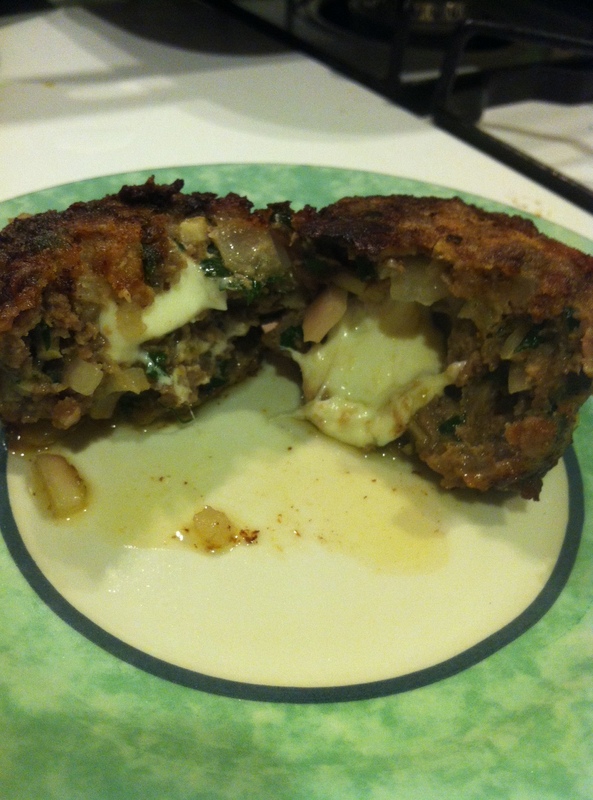 Take about a tablespoon of meat, cup in the palm of your hand, put a couple of pieces of mozzarella in the center, and then take some more meat and cover the mozzarella and shape into a meatball. Roll the meatball around in your palms. Make sure it’s compact. Once you finished all the meatballs, dredge in flour. In a large saucepan, heat up a small amount of olive oil over high heat. Once pan is hot place the meatballs and let them sizzle!! While they’re cooking, prepare your mashed potatoes. Use a ricer or masher and combine the potatoes with the milk, butter, and nutmeg. If they’re too dry add some more milk. Season with salt/pepper. 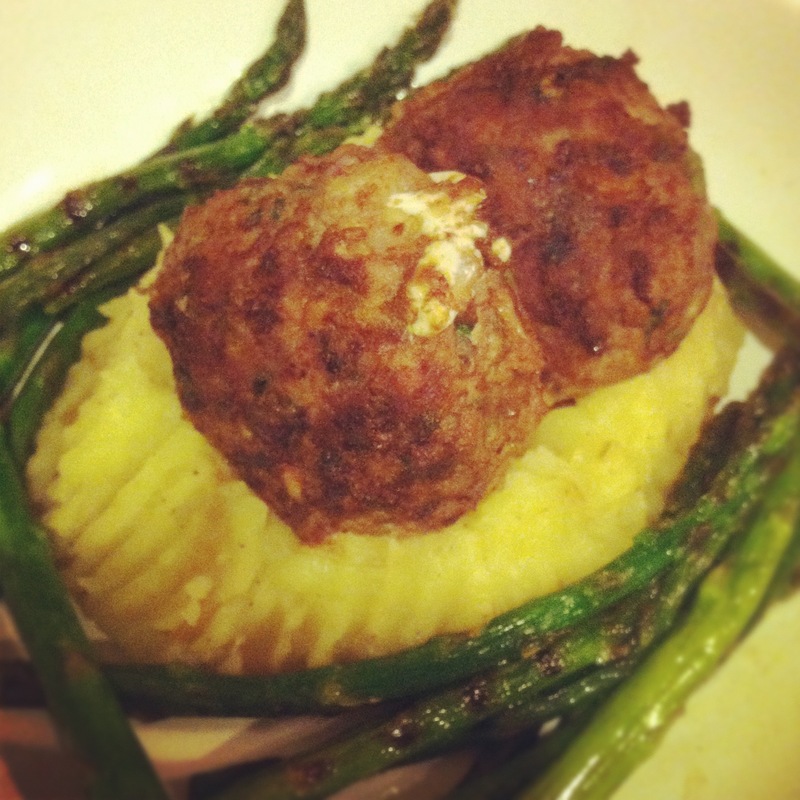 Once you’ve seared the meatballs on both sides, turn the heat to medium and continue to cook. You want the garlic and onions to cook and get soft. For the asparagus, heat up a grill pan. Mix your asparagus with some EVOO and salt. Place in the hot grill pan and sear them so you get some grill marks on them. I like them a little burnt. It’s up to you. These should take about 10 minutes, depending on how thick the asparagus stalks are.